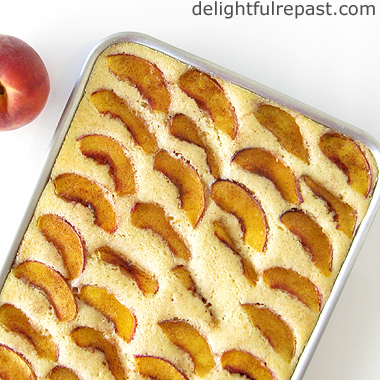 For those hot summer days when making a cake to be turned out of its pan onto a serving plate and frosted is just too much effort, or when you need a cake that's easy to transport to a picnic or potluck, try my little fresh peach sheet cake. If peach season has ended where you are, use frozen peach slices. Of course, you can use other fruits. 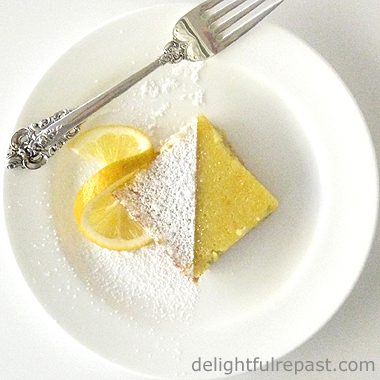 Or even no fruits at all because this tender butter cake is perfectly delicious on its own or with a thin layer of icing. The only special equipment required is a 13x9x1-inch quarter sheet pan. If you need to serve a crowd, just double the recipe and bake it in an 18x13x1-inch half sheet pan. Served right from the pan, it's perfect for any large casual party. I love my quarter sheet pans and need to order a couple more. This is my last post about peaches until next year, I promise! Summer fruit is the only thing I'm going to miss about summer! How about you? 1 Preheat oven to 350F/180C/Gas4. Spray a 13x9x1-inch quarter-sheet pan with cooking spray. Scrub peaches, no need to peel, cut in half and then cut each half into 8 wedges. In small bowl (I use a 2-cup glass measure) beat together buttermilk and eggs. 2 In medium mixing bowl, combine flour, sugar, baking powder and salt; with electric mixer on low speed, mix for 1 minute to blend (it takes the place of sifting). Add the softened butter and extracts. Mix on low speed until combined. Mix on medium speed for 1 1/2 minutes. Beat in the egg mixture in three batches, beating for 20 seconds after each addition. * Or you can, of course, just put them on there any old which way! Here’s a vote for “perpetual peaches.” For some reason I like peaches in the fall. They seem to go with chill, as if I’m cooling down from the summer. Cake not so much. Not a chill food. Ditto the different texture – peaches crisp or juicy, cake soft and blah. And maybe that’s why the contrast doesn’t work for me. It’s like someone messed up an anticipatory mouthful of cool smooth sweetness with something mushy and artificial. Peaches si, cake no. Anyway, count me as a vote for continued peaches presence in your columns. Thanks, Sully. Glad to hear you like peaches. And a perfectly ripe, juicy peach unadorned and unaltered is best of all. Thank you, BRnLC! I look forward to hearing how it turned out for you. Have a great weekend! That's a wonderful cake to farewell the summer, Jean. We love peaches and all the different kinds of stone fruits. This recipe would work great with plums too. Thanks, Angie! Yes, it *would* work with plums! Wonder if I can still get my hands on some? Seriously, this look so good. I'm gluten and dairy free and I think this would be easy to convert. Its so appealing I think I will give it a try! Thanks for sharing and your visit! Yum! I'm embarrassed to admit that the only peach I've had this summer is peach tea. I need to remedy that! Stat! Would you believe my husband just came home with a bag of peaches from the local fruit stand??? Thanks you so very much for this! Cathy, thank you. And, yes, it is very easy to convert to gluten and dairy free. I've blathered on so much about my GF substitutions and favorite formulas that I just left it out of this post. Thanks, Billie Jo. I envy you that bag of peaches! Happy September to you too! We love cake with fruit included. This recipe would be perfect for a group. My mouth is watering just looking at it. I'm really not a fan of overly sweet desserts but this would be perfect. Have a great Labor Day Weekend. Thank you, Marisa. I'm with you about overly sweet desserts! I hope you have a wonderful weekend. Jean, this looks really delicious. I wonder how it would play with "harder" fruits, like apples, which will be soon arriving. But there is still time for peaches and I plan to nab a basket at the farm market tomorrow. As far as I'm concerned, you can't have too many peach recipes for me! Thanks, Jeanie! Yep, I think it would work with apples, but I think I'd saute the slices first, just to soften them up a bit and get some of the liquid out of them. Fresh peach sheet cake time! Thanks, Christine! That's right -- in any time zone! Ohh, I have to try it tomorrow, we have so many peaches ripe in these days and we're going on preserving them, doing jam and so on .. but I so love cakes with peaches, they're the fruits I do prefer baked ! Thank you for another charming recipe, dearest, precious friend of mine ! This cake is a work of art Jean! How lovely! Thanks for sharing and linking. Dany, thank you so much. Would love to be helping you with those preserves, enjoying the warm peach aromas wafting throughout the house! Thank you, Bernideen. And the way it tastes with a cup of tea is amazing; it's a perfect food and drink pairing. Thank you, David. AND excellent point! I've been known to break that promise about peaches before! Thank you for sharing your delicious recipe at the #RecipeSharingParty. I look forward to what you will share next week! Do something special. Give yourself a standing ovation today! I love this idea Jean. Pinning. Thanks, Lea Ann! Much appreciate the Pin as well! Thank you, Charlene. And I'd be happy to do that! Thank you, Robyn! I agree, peaches are great in savory dishes as well as sweet. Popping back in to say that I'm impressed by you 8x/day tea consumption. Now are we taking 8 dainty teacups or 8 huge mugs?!? I didn't get my peach fix this past weekend. Labour Day fail! I hope you had a splendid Labor Day. Hugs to you! Thank you so much, Stephanie! I was just thinking about you and your dear mother. Yes, I had a splendid (relaxing) long weekend. Hugs back! I love peaches! sounds delicious. Thanks, Clare. Hope you'll try it before the peaches disappear. Sounds like a good breakfast to me as well, Summer, along with a cup of tea! Jean, that is a lovely looking cake! You must live in a warm climate because I can't get enough of summer. Autumn is short here and the next thing we know, we have months of freezing winter weather. I do not like the cold. That's probably one reason why I always bake more in the wintertime. Helps to keep one warm with the oven on. I would sure enjoy a slice of your beautiful cake, so artfully made, with a cup of tea. Thanks for sharing and have a lovely day. Thank you, Sandi. It's true I don't like hot weather, but I don't like cold weather either! That makes life tough, believe me! :D Ideally, I would live in a (nonexistent) place where the temperature is always between 65 and 70 degrees with the perfect level of humidity, an atmospheric moody bit of fog now and again and the perfect amount of rainfall evenly dispersed throughout the year, oh and little to no snow or ice. And while I'm at it, no hurricanes, earthquakes, tornadoes or other natural disasters. I'm not asking for much, am I! Thank you for your recipes,I love peaches!!!! Nadie, thank you. I'm so glad you like my recipes! Thank you, Courtney! That's just how I feel about your peach blueberry crisp! That looks good enough for me to want to be your neighbor. Yummy! Thanks for joining the DI & DI Link party. Have a great week. Aaw, thanks so much, Christine. That would be great! We're still seeing some fab stone fruit in Nor Cal, and I couldn't agree more about opting for a sheet cake over one to stack and frost hoping the heat of the day won't melt the effort away. I adore my quarter sheet pans too. Lovely recipe, Jean. Thank you, Brooks (The Cake Man)! I don't think a lot of people have quarter sheet pans, and I wonder why! Hi, I would love a slice of this right now! Sounds like a moist cake and I love peaches. Wishing you a nice day. Blue sends her greetings to you! Thanks, Mildred! And Blue! This does make a lovely breakfast, I think. Janice, it was my pleasure! Thanks, Bridie! Much appreciated. Hope your daughter likes it! 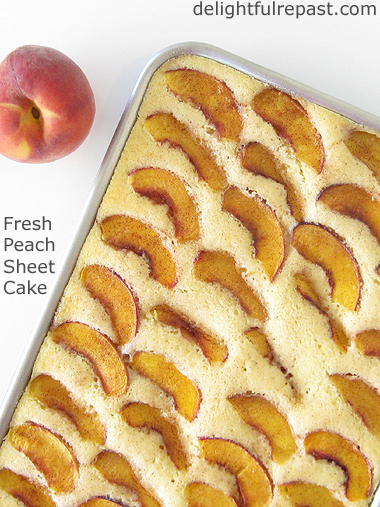 Your Peach Cake looks so perfect and sounds like a perfect taste of summer! Thanks for linking up to the Country Fair Blog Party! Thanks, Val! Peaches were the best part of summer!